Yesterday Facebook announced 3 updates to its search features, which may turn SEO upside down and give real estate agents more free tools to promote their property listings. What has changed. Now, Facebook users can search not only their news feeds and what their friends post, but also every public post and data. This is a huge change for Realtors if you can use it right. Do you know how many searches people conduct on Facebook every day? Facebook has over 2 trillion status updates in its index and Facebook users conduct over 1.5 billion searches every single day. Yes, it is 1.5 billion searches every single day. Imagine how many searches are related to real estate, mortgage providers, housing, home improvements or neighborhoods. Search results with public posts and posts from friends. So now, because of Facebook allowing users to search all public posts, SEO specialists can take a notice. This list is not conclusive, but is a start. If you have additional suggestions, please comment below. Does your real estate business get more referrals from Facebook? Also see How Realtors Can Benefit from Bing: Key Ranking Factors. Thanks for the heads up. This will be great if utilized correctly. You are most welcome Winston. You are most welcome Winston. Yes, indeed it will be great if we utilize this tool correctly. Now we need to learn how Facebook ranks search results. It ranks by popularity and by latest. 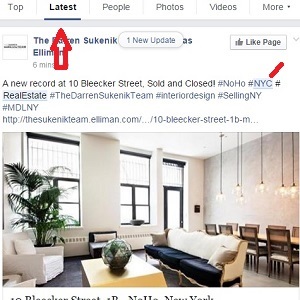 How to make your post more popular, that's the challenge for Facebook SEO and for Realtors.